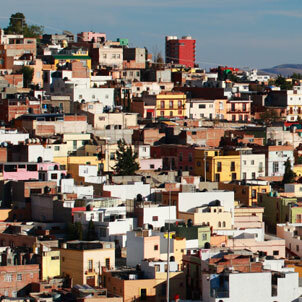 Zacatecas (population 183,000) is known as "la ciudad de cantera rosa" or "the city made of pink stone". A beautiful city on a hill (8200 ft. / 2485 m.) which seemingly grew overnight in the mountains of Nowhere Mexico . . . In truth, it was the discovery of Silver in them there hills and the subsequent mines that were responsible for the rise of this city in 1546. Note : Zacatecas mining operations were one of the main providers of Spanish gold while Mexico was a colony known as New Spain. An interesting factoid about the church of Santo Domingo here . . . It turns out that this is actually one of the churches built and occupied by the Jesuits before King Charles III of Spain ordered his recently appointed viceroy to New Spain, Carlos Francisco de Croix, to expel the Jesuits from the colony in 1767. It appears that nothing other than speculation exists to explain why. The Jesuits were seen as interpreters of orthodoxy, universally loved by the people, and their expulsion caused uprisings throughout the colony. While no more than speculation exists to explain this extremely unpopular move, one must always assume that governments, kingdoms, and despots have but two motives . . . money and power. Something or someone within the Jesuit order was seen as threatening one of these . . . did someone use the "D" word (democracy)? Well, Mexican independence was declared in 1810 and half a century later came the Reform Wars. This time the Augustinian Friars were expelled from the church of San Agustin as the property was made public . . . sold, and reportedly turned into a hotel with a pool hall and casino. As expected, there were excommunications O' plenty as the Bishop of Zacatecas promptly condemned those responsible to burn in hell for all eternity. Today . . . tourism, rather than the Silver mines, are what drive the economy of Zacatecas. Old churches still decorate the narrow stone streets of this beautiful city . . . but the Mercado and small jewelry shops are where most of the money (and Zacatecan silver) changes hands. There was once a very important battle which took place on the top of a nearby hill (La Bufa) in the revolution (1920). Take the sky car to the top where you will find a nice museum and great views of the city. There is also a mine that you can visit right in the middle of town (Mina El Eden) where you can take a tour and learn about the procedures used to collect and process the ore. It can be very cold in Zacatecas, so check the weather forecast before visiting La ciudad de Cantera rosa.